We are Leading Trader of Welding Holder to our client. We offer 'MESSER' make heavy heat resistant DMC handle. This holder can be used up to 600 Amps Current rating for ARC Welding applications. With our expertise and trustworthiness, we are engaged in offering an optimum quality range of Welding Electrode Holder. Best in finishing, these Welding Holders are light in weight and optimal in finishing. Safe from heat and other effects, these holders are reliable and crack proof in nature. Completely insulated in nature, these holders keep users away from high heat. Additionally, these holders are available in the market at minimal price. Alfa Welding Electrode holders are the ideal for adverse welding conditions such as shipbuilding, fabrication, construction and dockyard. material used : gun metal and copper strip. The urge to innovate and challenge our limits has driven us towards our goal of producing quality products, that genuinely have 'quality'. One such range is Tool Holder For Welding Machine that is highly demanded in industries. The offered products are made out of premium quality raw material incorporating latest technology. Our Welding Holder is available in various sizes and shapes. All the cables offered by us are in line with the is specifications and international quality parameters. These welding holders are manufactured using high quality brass and other alloys at manufacturer end. We are manufacturing and import the Welding Holder products from universal market in competitive price. We have maintaining the entire ranges of Welding Holder product. 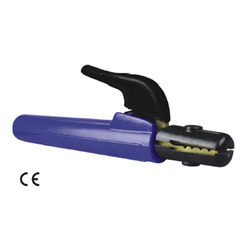 Crocodile style type 'B' fully insulated electrode holder, conform to IS-2641.Its handle, lever, spatter protection guards are made of fire retardant andheat resistant imported material. Special quality of copper alloy as mainconductor & brass jaws ensure good contact with electrode and continuousduty cycle. This holder is very light weight and suitable for cables up toAl120/Cu70 sq.mm. - The Grip Jaws of Copper Alloy Can btain stable ARC Under high current for superior welding Effects. 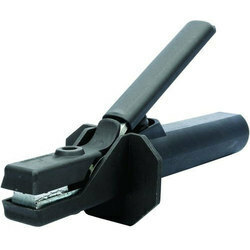 - Jaws covers made of special fire retardant compound are spatter proof & have high impact strength. - Low profile leverage reduces welding fatigue. - Insulated parts can withstand high ARc Resistance current. We have been providing high efficiency Welding Holder to various industries. Welding Holder, offered by us, is designed using superior quality raw materials with latest technology. Available in various sizes, our gamut of Welding Holderis sure to provide excellent performance to the clients.